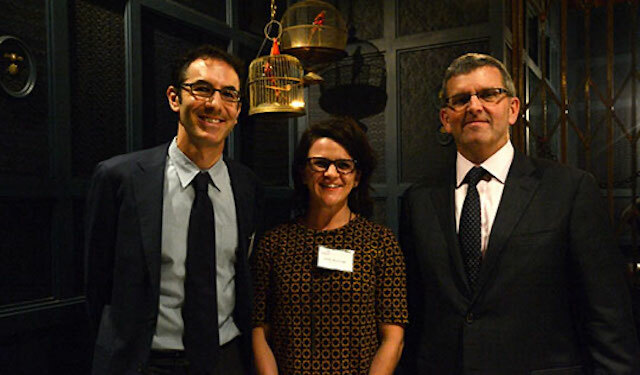 TechnoServe’s first Volunteer Consultant, Eric Sillman (left), joins New York Alumni Chapter Leader Lindy Mockovak and TechnoServe President William Warshauer at a reception celebrating the program's 20th anniversary on October 13 in New York. Eric Sillman, co-founder of investment firm Aperture Venture Partners, believes his early entrepreneurial experiences volunteering with TechnoServe in Peru in 1996 played a big role in his career. As the fiirst alumnus of TechnoServe's Volunteer Consultant Program (now the TechnoServe Fellows Program), he shared memories and reflections about his service while speaking at a recent reception in New York celebrating the program’s 20th anniversary. The early entrepreneurial experience I gained at TechnoServe absolutely contributed to my career, especially working in some challenging environments where the answers are not readily available. Inspired by how tangibly and powerfully TechnoServe’s work can transform lives – an impression echoed by hundreds of other Volunteer Consultants – Eric carved out time from his career to take three more Volunteer Consultant assignments in Central America and East Africa over the next seven years. Volunteer Consultants are top business professionals who contribute their unique skills and expertise to TechnoServe projects across the world. In 2015 alone, 73 Volunteer Consultants worked with TechnoServe field teams on 76 projects in 18 countries, contributing over 40,000 hours. 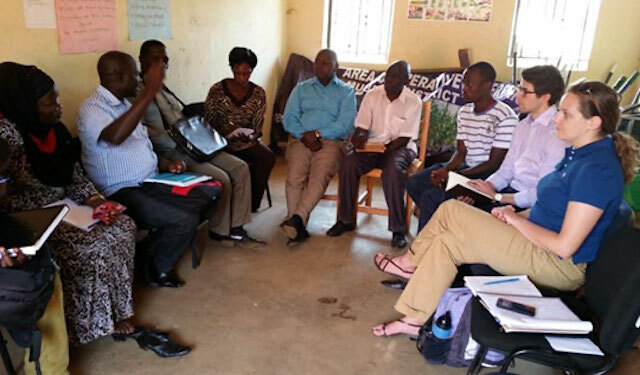 Moritz Steinle, TechnoServe's 1,000th Volunteer Consultant, discusses key challenges with representatives of a coffee cooperative in Uganda. 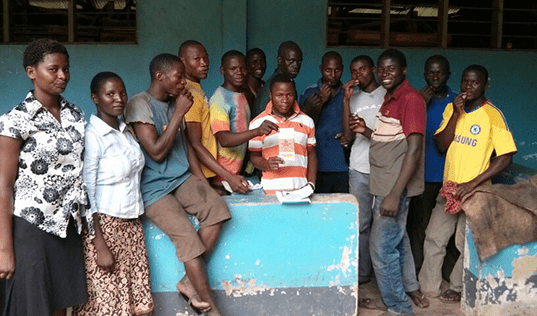 This year, the program placed its 1,000th volunteer, Moritz Steinle spent six months in Uganda helping farmer organizations build relationships with local service providers. While volunteers work on a variety of projects, many assignments involve value chain and market assessments, or client services in strategy, finance and operations. 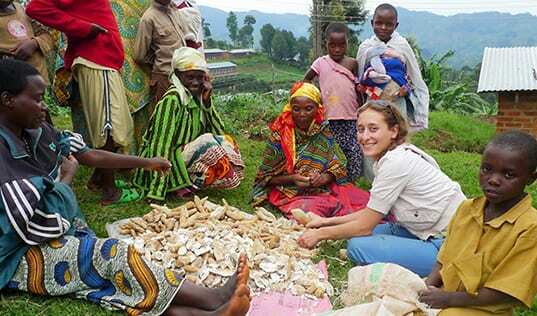 Volunteer Consultants have developed national cocoa strategies in Tanzania, leveraged public-private partnerships for food security in Uganda, and promoted entrepreneurship among Tibetan settlements in India, among many other contributions. The 20th anniversary was an opportunity not only to honor the many hours and skills contributed by the program’s 1,000 participants, but also to celebrate a network of talented and mission-driven professionals. Many volunteers continue to contribute to the TechnoServe community either as consultants or staff, and by staying connected through alumni chapters. The hands-on experience of working with businesses and market systems in unique environments has helped Volunteer Consultants grow their careers. Some, like Miishe Addy, who supported a coffee project in Colombia, have started their own social enterprises. “[TechnoServe] showed me the value that people like me, coming from the relatively structured world of professional services firms, could offer to community leaders in developing areas,” Miishe said. TechnoServe is grateful and proud of the work of 1,000 Volunteer Consultants over the past 20 years, but there is more work to do. As Eric pointed out, “the need is absolutely still there in the economic development world.” If you are interested in becoming a Volunteer Consultant, we encourage you to find more information here.